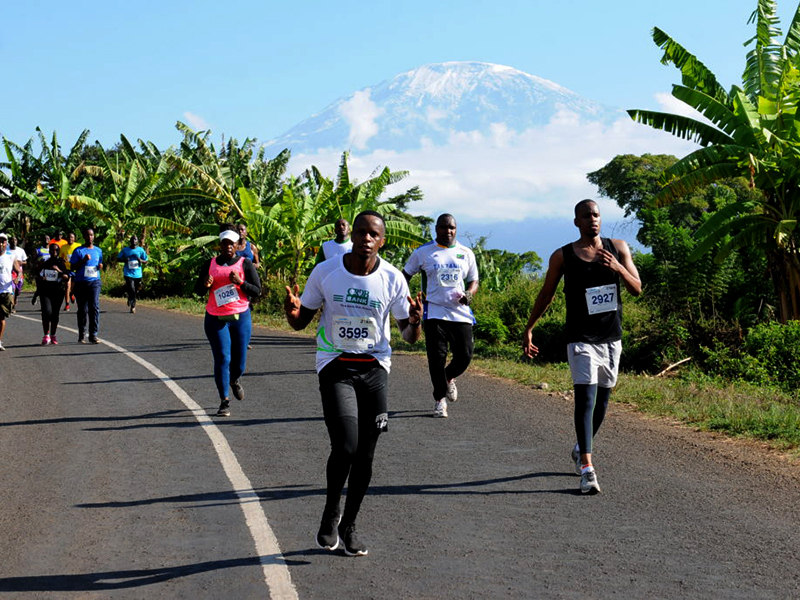 Defending champion Cosmas Muteti and Lydia Nasimiyu Wafula claimed contrasting victories for Kenya in the 17th annual Kilimanjaro Premium Lager Marathon which took place in the shadow of Africa’s highest mountain, Kilimanjaro. The 42km and 21km events which started and finished in the town of Moshi in Tanzania, attracted a field of just over 6 000 entrants with the top places being dominated by Kenyans. 2018 winner Muteti completed the 42km in a time of 2.18.27 – just over a minute slower than his 2018 time – which ensured he beat second placed David Kipkorir Rutoh by 81 seconds, with the Kangogo brothers, Philip and Felix, claiming third and fourth respectively. The women’s event was won by Lydia Nasimiyu Wafula whose time of 2.52.17 ensured she had a relatively easy six-minute victory over Monica Cheruto with Teclah Chebet third, ten minutes further back. Both Muteti and Wafula picked up four million Tanzanian schillings, the equivalent to about R25 000, for their victories on the scenic route which passes through parts of Moshi as well as meandering past many smallholding farms and villages, banana and coffee plantations and patches of forest. 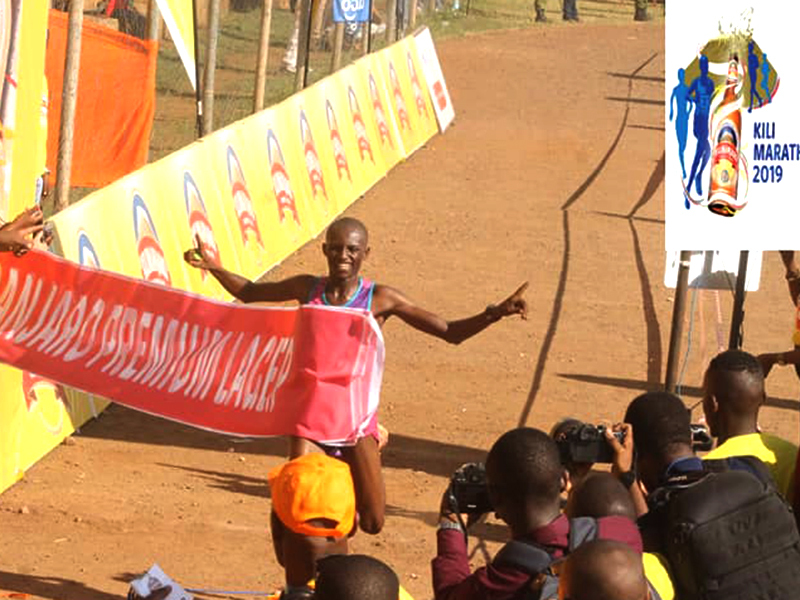 Cosmas Muteti crosses the line to successfully defend his title in the Kilimanjaro Premium Lager Marathon. All photos: Jetline Action Photos. A huge field were excited to be running in the shadow of Africa’s highest mountain (above and below). 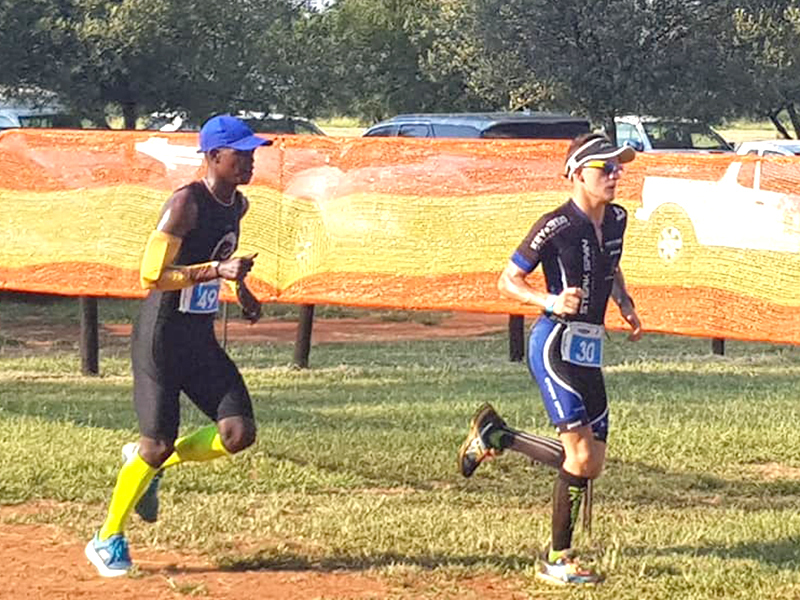 Boikie Mongreng and Brendan Havenga were the big winners at the Sondela Extreme duathlon and MTB events respectively at the nature resort north of Pretoria over the weekend. On Saturday Havenga beat Tienie Prinsloo by just 22 seconds in the 65km main MTB event after he finished in a time of 2.23.31. Paul Essakow was third, six minutes further back in 2.29.55. The women’s race was won by Rimari Sutton whose 2.41.27 was just over seven minutes ahead of Alma Bester with Lizette Cave third, another six minutes back. 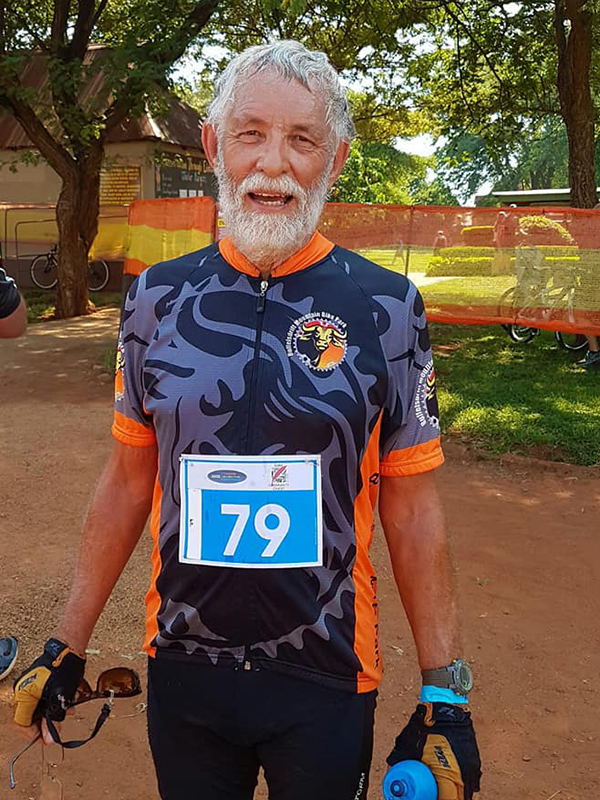 In the duathlon on Sunday, Boikie Mongreng edged out Franco van der Merwe by a minute after 72 minutes of tough competition in which third-placed Christo Wentzel looked like claiming the honours for much of the event. Mongreng and Van der Merwe were together for most of the run before Van der Merwe eked out a small lead in the transition to the cycle leg. Mongreng reeled him in on the mountain bike course, but it was Wentzel who was quickest on two wheels and Mongreng and Wentzel entered the second transition zone together, with Van der Merwe a minute behind. Once again Van der Merwe reduced the gap with a slick transition, but Mongreng was too strong on the short second run and increased his lead steadily to 59 seconds over Van der Merwe, while Wentzel faded back into third. In the women’s duathlon, Mariana Gahler was first to finish the run but she was let down on the cycling leg and drifted out to a fifth. In contrast Alice Coetzer produced a consistent times throughout and after taking the lead coming out of the first transition was never in trouble as she built a two minute buffer on Natasha Swanepoel. Franco van der Merwe leads Boikie Mongreng at the end of the first run leg in the Sondela Extreme Duathlon on Sunday. Sibabalwe Mzazi produced a quick 30.01 time to claim the title at the Century City 10km on Sunday when he beat Vuyolwethu Mbukushe by just four seconds with Mbongeni Ngxazozo third, just nine seconds further back. 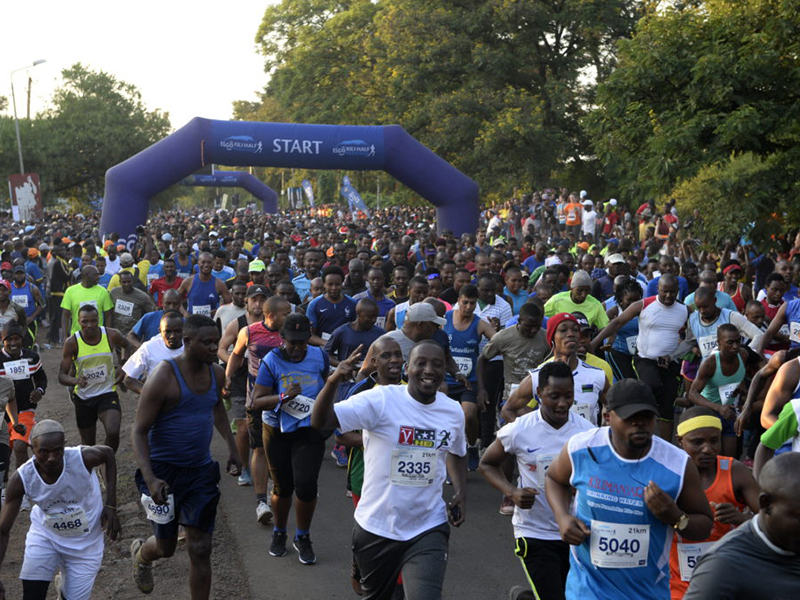 The top three at the finish also had a small gap at the halfway mark and as they surged and counter-surged they extended their small advantage until Mzazi was able to make the decisive move near the finish. In the women’s event Fortunate Chidzivo finished in an impressive 34.45 which saw her claim an impressive 16th overall and allowed her to beat Zintle Xiniwe and Kyla van Graan into second and third in the women’s category by just over a minute.